Does Registration Under Shop Establishment Act & Udyog Aadhaar Same Thing? Establishments in India varies with respect to investment, size, and output. There are some entities which are engaged in commercial activities, some in entertainment products, some in manufacturing & productivity while some in the rendering of services. Each of them is regulated and controlled through various laws and legislation of government. If you own a small coffee shop or a manufacturing unit of coffee, both require compliances to multiple laws. But, which law will govern which establishment is difficult to understand. Here in this article, you will get to know the registration perspective of businesses under the State Shop and Establishment Act and the MSMED Act through Udyog Aadhaar Memorandum (UAM) and what features they both share in common. The act provides general rules and policies for doing business – to be followed by all entities irrespective of their scale of investment in the business including all small shops, establishments, eating houses, clubs, hotels, restaurants or other places of amusement and entertainment. To establish and operate a business from a shop or establishment under the respective State rules. The rules will vary according to the applicable State act of the entity. To comply with stated business guidelines under the act related to working hours of business, payment of wages, leave/termination policy, terms of service, holidays, etc. To cover registration of each and every place of business in the state except for entities those falling under the Factories Act 1948. To place the certificate obtained on registration on the respective place of business and get it renewed at appropriate intervals. The act provides the minimum eligibility criteria of businesses to get registered under the act if engaged in the manufacturing of goods or rendering of services working as MSMEs (Micro Small and Medium Enterprises ). Udyog Aadhaar Memorandum (UAM) is an identity document issued to eligible MSME entities which other than normal business registration simplifies the registration process for MSMEs within few steps. It also helps MSMEs avail all benefits and credit schemes of government issued for MSMEs. To register and operate business as MSME, if compiled to eligibility of business stated in the act in terms of investment made in plant & machinery and service equipment. To avail the benefits of timely issued government schemes through the Udyog Aadhaar. To file necessary business returns under respective tax laws. 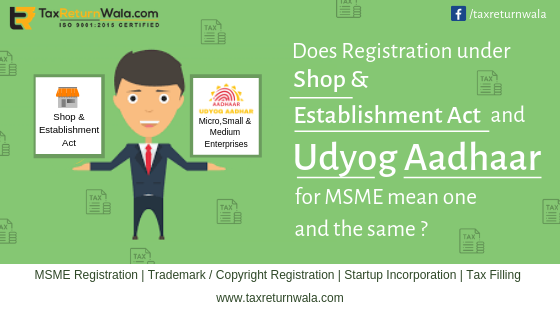 In short, registration under MSMED act through Udyog Aadhaar portal opts for registration of businesses as a special category being Micro, Small or Medium enterprises to avail benefits of government issued for MSMEs. To run the business as recognized MSME and avail benefits of schemes issued by government & agencies for MSMEs. 3. Eligibility To be applied by all shops and establishments holding commercial activities including hotels, clubs and all other places of amusement & entertainment. To be applied by all entities registered in any business form (LLP/Company etc) complying to minimum registration criteria in terms of investment in plant & machinery and service equipment. Specifies rules and policies for only entities registered as MSMEs. 5. Registration formalities Filling of basic details and documents of business to the district labor officer specified by the Labour Department of the state. Filling of application online with all respective documents, details of a business. 6. Mandatory or not Mandatory for all entities excluding few exceptions. 7. Obtaining licenses It is generally not required for obtaining any major licenses but is helpful for the opening of the current account of the business. – Bank account of the business. 8. Tax Benefits The issue of a license under this act does not provide any specified tax benefits. Special exemptions under GST and Income tax is provided for entities registered with Udyog Aadhaar. 9. Renewal Policy Varies as per state rules for shops and establishments. To be renewed by certain entities every after 5 years. License obtained under the State Shop Establishment Act specifies general rules, regulations and duties of all business shops and establishments towards there employees and the provisions therein, while the Udyog Aadhaar Memorandum as applied under MSMED Act guides for statutory formation and recognition of MSME entities for compliance following and availing of benefits issued by government for MSMEs. Note: Obtaining a license under Shop Establishment Act is mandatory subject to only a few exceptions.